At Falcon Pine we don`t just make furniture or fit kitchens etc, we do every aspect of anything to do with pine. So that means we stock excellent quality reclaimed or new timber floorboards in various sizes,which we fit in homes to provide a floor that lasts for generations. We can stain in any shade you wish, most customers opt for a clear matt floor oil which shows the grain to its best and also provides a durable finish. 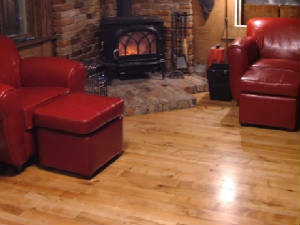 We can also mix the floor oil with various stains to obtain a darker finish to whatever your tastes are. The floor oil is also suitable to cover over a hand wax finish which we often do on our reclaimed or new pitch pine floors. 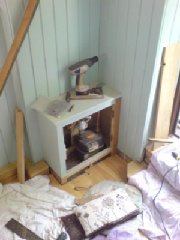 We can fit floorboards over existing floor surfaces, or directly onto joists. 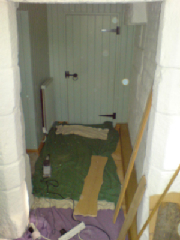 Or if the surface is over stone etc that has possible damp etc, then we offer a full service to cover with quality plastic sheeting, batons and insulated boarding which is then covered with the actual floorboards. This makes the flooring much warmer and leaves the customer feeling safe in the knowledge that no damp will penetrate through the newly laid floor. We Supply our solid timber floors in a variety of sizes and types of timber. Our most popular types are from new pitch pine, oak or reclaimed pine. We have displays in our showrooms as well as examples of many different floorboards, we specialise in fitted work and can fit large rooms or small rooms - the size of the order is not a concern. For advice on how to go about how to order a floor please ring Michael on the mobile number below. At Falcon Pine we make items of furniture, kitchens & fitted wardrobes from new timber which we insist on only buying from timber yards that purchase from sustainable pine forests. But as well as timber floors from new timber, we fit using reclaimed timber which is the preffered option as we really are a company that cares for the world in general & by offering this service we feel we are doing our bit for the environment. It`s easy to order a reclaimed timber floor, all you have to do is call into the showrooms to view our samples or telephone Michael on the numbers below so that he can come out to measure up. Following that he will send out a detailed, exact quotation and information pack and then should you wish to order its just a case of leaving the required deposit and a fitting date arranged to suit you.